Can you tell that I cannot wait for the cooler Autumn weather to start breezing through? I just love every single thing about about Fall! The orange, red, and golden leaves, pumpkins and the crunch of acorns under my feet as I walk down my scenic street. The beautiful tunnel of colorful trees, and the crisp air have me yearning for the end of September already. 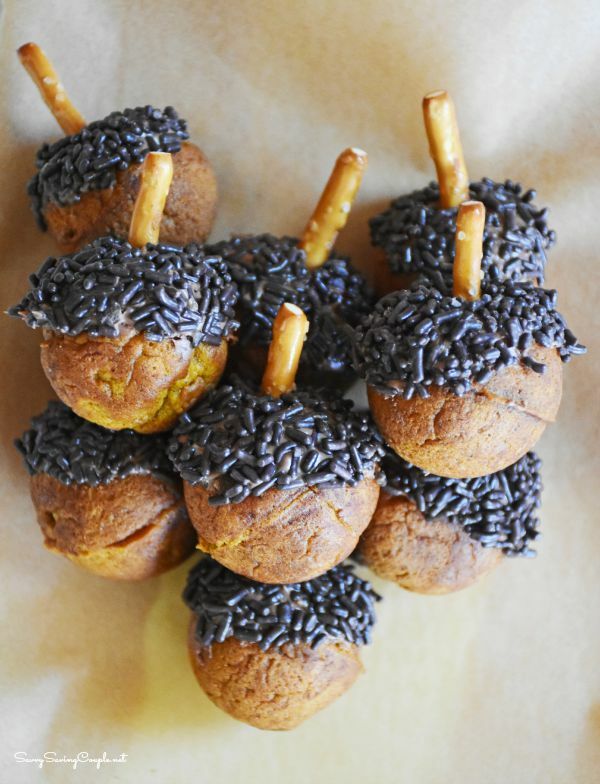 To celebrate my love for all things fall, I will be making a ton of pumpkin based treats in the next couple of months. My goal is to create 10 fall inspired desserts between both this site, and my food blog Sizzling Eats. 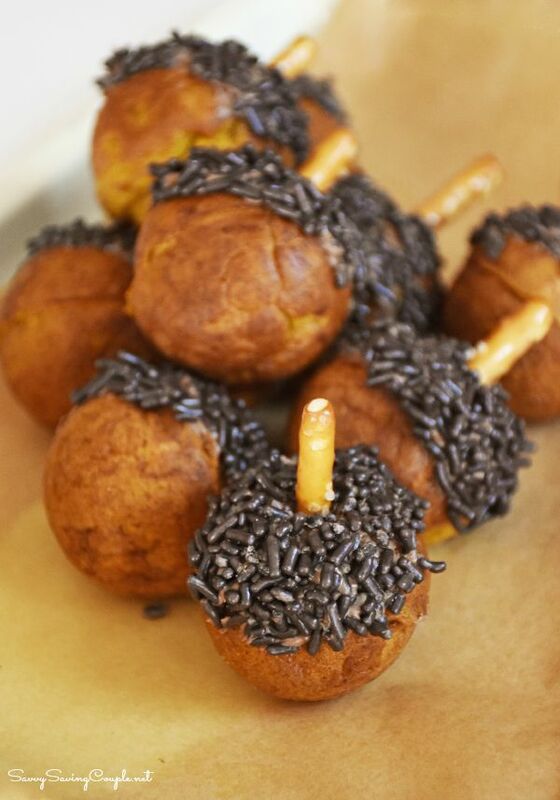 Today I made some Glazed Pumpkin Donuts, and these adorable Sweet Pumpkin Donut Hole Acorn Treats. 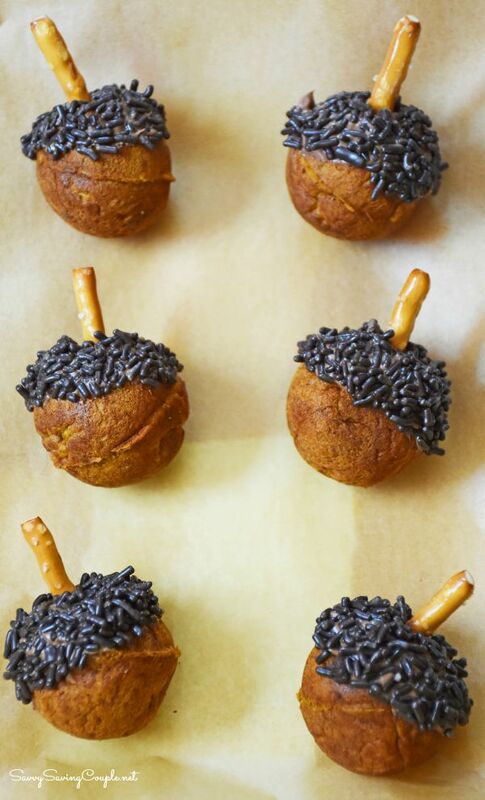 I remember making these Acorn Donut Hole treats with the kids in school. 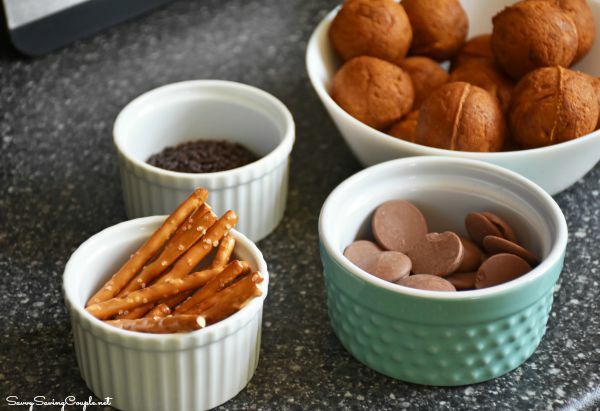 We didn’t make our own donut holes though, but we did dip the tops in chocolate, and add the jimmies, and pretzels. These were so fun to make and the fact that we really only needed a microwave made it ideal. Since I found the perfect not too sweet pumpkin cake recipe last year, I decided I would use that for my cake hole maker. I baked up my thick batter for 6 minutes and made a few dozen of theses pumpkin donut or doughnut holes. I left some plain, and turned about a dozen into these adorable Sweet Pumpkin Donut Hole Acorn Treats for my daughter’s birthday. Heat up and grease your donut hole maker. Add to greased donut hole maker, and bake for 6 minutes or until golden brown. Once donut holes are cooled, dip them in melted chocolate, and then jimmies. Gently insert one half of a pretzel stick and place on a waxed paper baking sheet until hardened. 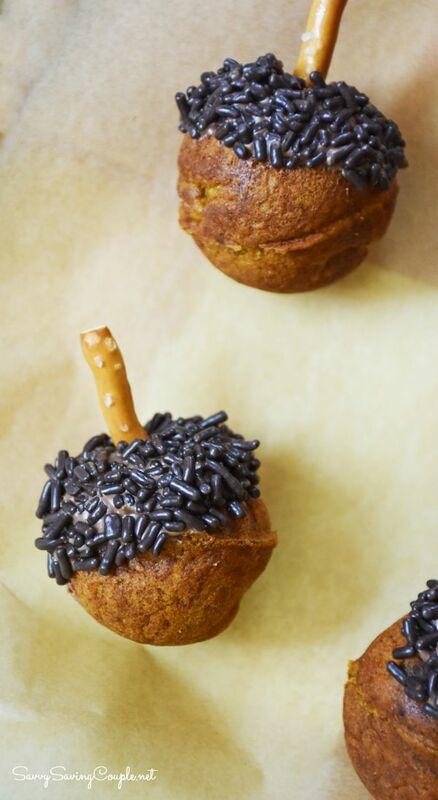 These Sweet Pumpkin Donut Hole Acorn Treats are super adorable and make the perfect harvest activity for your children because they are not hard to make. 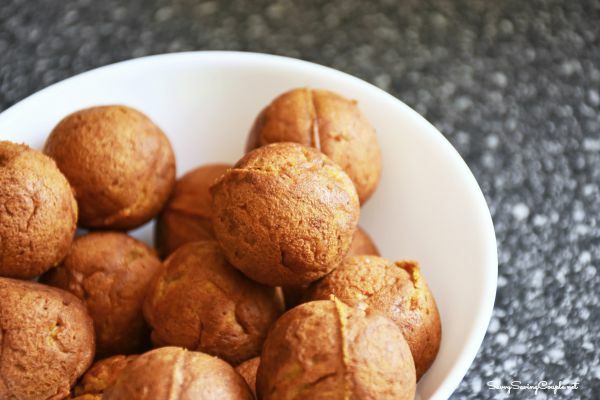 Get the recipe for Cinnamon Sugar Pumpkin Muffins too! Now this would be a fun treat. The pretzels were a really nice finishing touch! Those are the cutest little acorns, haha! I love the little pretzel tops too! Those are so cute! Plus donut hole, how can you get better than that? I love it. This is sucha cute idea. I will have to make a bunch of these up for the kids lunches. These sound like they would be a good treat!! I love pumpkin and am so ready for fall weather so we can bake more! I love this idea! 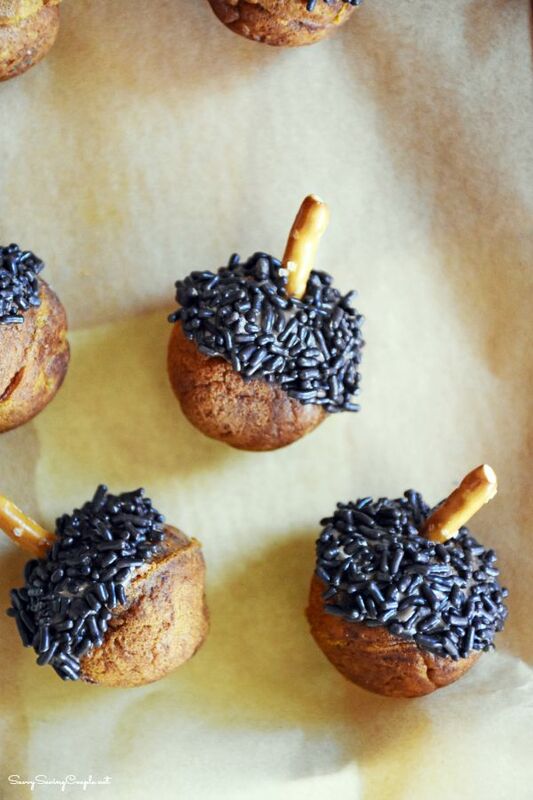 These looks like the perfect Fall treat! I think we’re going to make these on the first cool day! Cool – another use for our cake pop machine! We’ve been looking for new ideas! Seriously, these could not be cuter! They are putting me in the mood for fall! What a fun treat to eat and make. My kids would love to make this!